Your bedroom is one of the most important places in your home. It's where you rest and regroup, where you get wrapped up in a novel, get ready for a date, play your favorite songs and most importantly – get a good night's sleep. This is why you shouldn't overlook your bed! It should be cozy and comfortable, but trendy and stylish so that it looks inviting, feels warm and offers you the perfect amount of rest so that you can get up tomorrow and get going with a smile on your face and a spring in your step. Today at homify, we are going to explore eight stylish beds for the bedroom, which will give you an indication of whether or not it's time to invest in new cushions, linen, pillows or perhaps a brand new bed! Scandinavian style is known for its combination of light and color as well as how modern and minimalist it is. In this design, we can see how well this works for a bed! A simple wooden bed frame with denim blue linen and cushions creates a space this is as inviting as it is stylish. Tip: Choose a few tones for your bed such as the light baby blue and the darker denim blue that we see in this design. This creates a bit more texture and tone. We've spoken about how your bedroom should be a cocoon or a haven from the rest of the world, which is why nature can play such an important role in it. Adding potted plants, like in this design, a vertical garden or even a vase of flowers to your bedroom can completely enhance it, enhancing the space with fresh and natural decor and design. 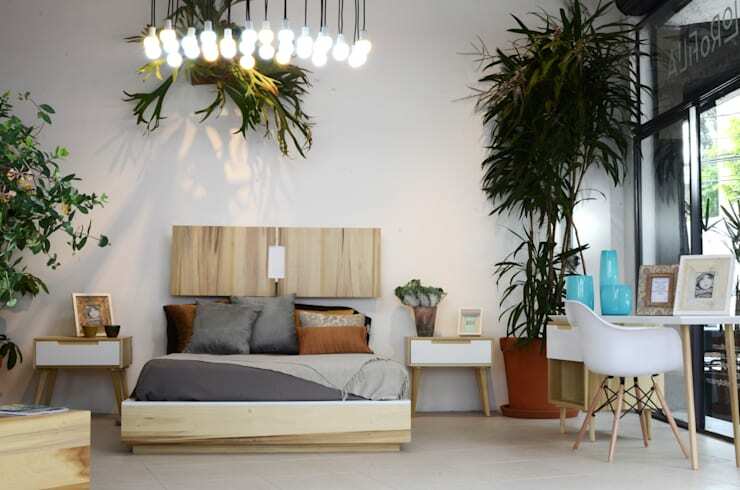 The plants also helps to circulate fresh air as well as breathe new life into the bedroom space. Remember that ventilation is really important for the bedroom. Open up your windows each morning when you wake up, even in winter, to allow fresh air in! Your bed should make you feel like royalty, so don't hold back on investing in high quality and classic furniture that is not only comfortable but looks luxurious too. In this design, by professionals Mozza Dizayn, we can see how adding a touch of color as well as a touch of extravagence to the design of the bed can enhance the whole look and feel of the room. 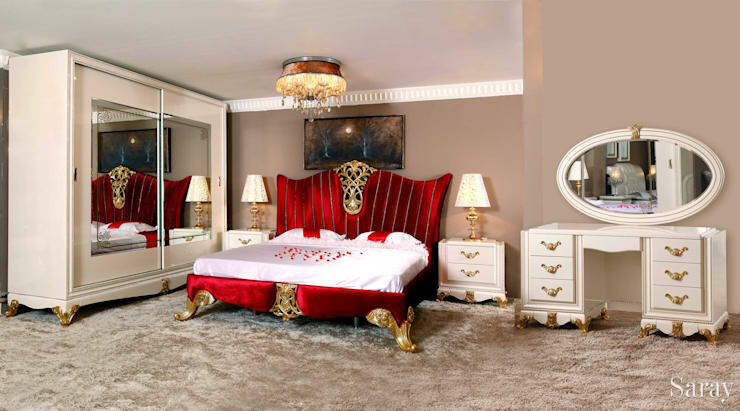 Pair with plush carpets and you have a bedroom fit for a king or queen! 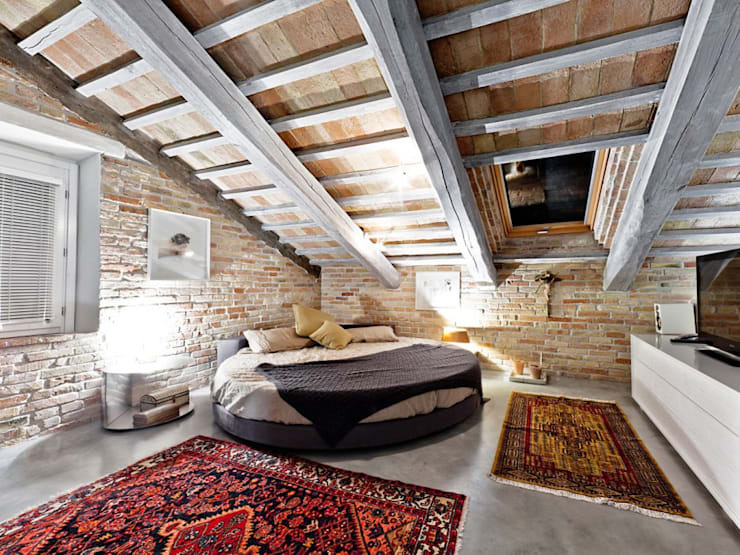 Your bed doesn't always have to be the traditional or classic shape or design. In fact, you can do whatever you like in your own bedroom! In this design, we can see how the decorators have gone for a round bed, which fits into the rustic style of the room beautifully. Your bed is so personal, that you really should opt for what makes you most happy and most comfortable. Go for a waterbed, a set of bunk beds or even a king size bed that takes up the entire room. 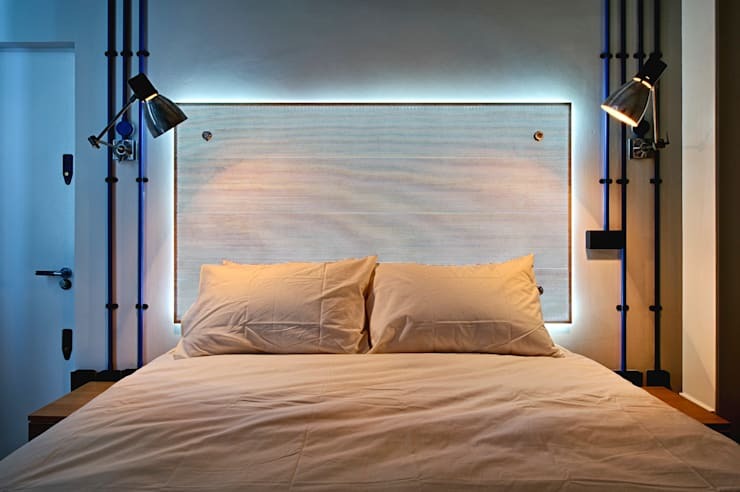 Have a look through these homify beds & headboards for inspiration! If you don't have too much space available, you need to be very strategic with the furniture that you choose for your home and the bed is no exception. 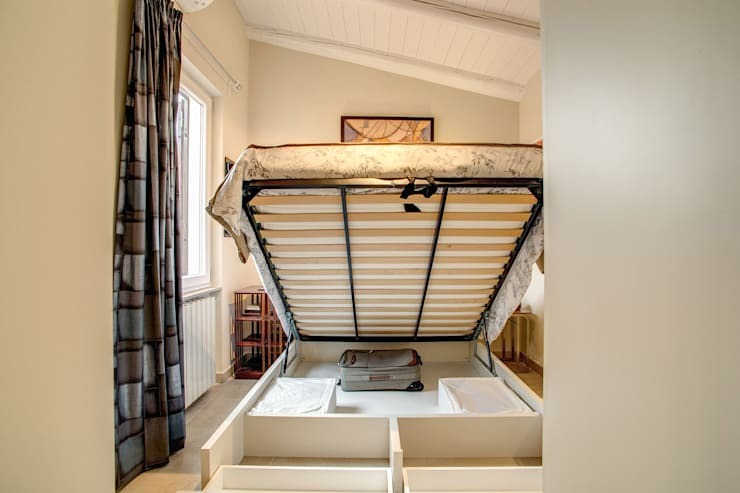 Go for a bed that features drawers underneath it so that you can store extra clothes or luggage underneath it or choose a bed like this one, which lifts up to reveal all sorts of storage solutions. If your home is really small, you can choose a bed that doubles up as a sofa or folds up into the wall to ensure that you make the most of space available to you. 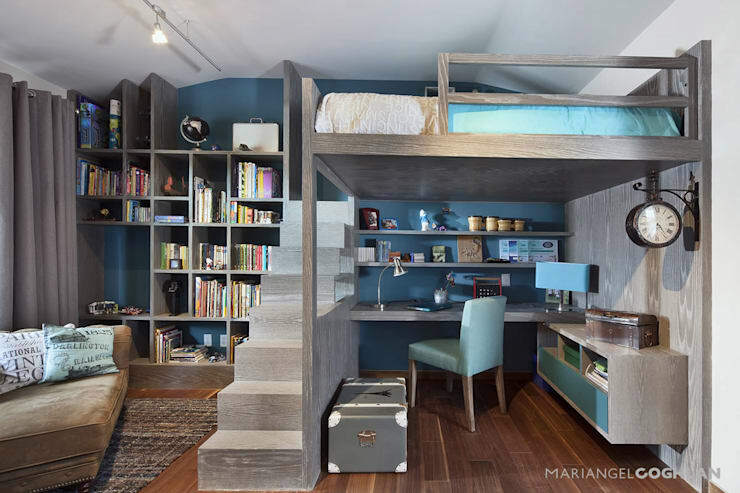 An option that saves space and is especially exciting for a kid's bedroom, is to design a little loft area for the bed, similar to the one pictured. This not only allows you to utilize your square footage in the most effective way possible, but it creates a much more exciting and special bed space for yourself or your family members. And look at all the extra space it creates! You can fit a whole office and work area under the bed. Earlier, we discussed opting for smart furniture such as a bed that folds into the wall. Here we can see just how effective this design can be. It also doesn't have to compromise on the quality of your home. In fact when many of us think of fold-up furniture, we think of dark and dingy apartments that feature low quality and cheap beds, chairs and tables. In this design, we prove just how wrong this association is. Your home can look absolutely beautiful with fold-up furniture. It's also incredibly functional too. Have a look at these inspired storage solutions for small homes. No matter what bed you end up going for, don't forget how important it is to use lighting to create ambiance and romance in your bedroom. Opt for lots of candles, soft lamps or lights in the ceiling that dim. You can get really funky with lighting or go the classical and more traditional route. Remember to spend time picking out your bed and matching it with decor and design accessories. There's no rush! If you like this ideabook, then you'll love this one on: sleep better in your ideal bedroom. Which is your favorite bed?